There was great excitement at Oxford Gardens School as we prepared for the Coronation. In my class it was decided that we should make a fabric panel to portray the most important people taking part in the ceremony. ” My ” person was the Duke of Norfolk. He would be wearing a velvet robe, in purple, a colour which I thought quite marvellous. My teacher, Miss Tongs, gave me a piece of wide purple velvet ribbon to work with and I can remember holding it and stroking it, almost reverentially. Touching velvet even now still conjures up the same glorious feeling. We also learned all about the Coronation ceremony, the regalia, its traditions and symbolism, and who would do what and when, and who to look for and so on. On the day of the Coronation itself I was invited to our next door neighbours to watch their television as we did not have our own. We all sat glued to the – really tiny – screen and then I was invited to stay to lunch. I remember eating cold cooked cauliflower very, very slowly. At School we had a fancy dress party, our outfits depending on begging, borrowing and raiding dressing-up boxes and our mothers’ sewing abilities. At the end of the party we each received a small commemorative glass mug, which still sits at the back of a cupboard after all this time. We were also included in the nationwide Coronation celebrations. The whole school – and presumably other local schools too – was taken to help line the route of the royal tour of London. We were taken to a spot near St. Helen’s Church, although I suppose the Church wasn’t there then, and we stood near the junction of St. Quintin Avenue and St. Helen’s Gardens. We then waited ages and ages and ages, or so it seemed at the time. Eventually, at a given signal, we all began to cheer, and a large car flashed by. It presumably held the Royals but I don’t actually remember seeing them, perhaps I blinked! My memory is of a very long wait, a deflated sense of occasion and the rear view of an extremely large, black car, a far cry from all the pomp, glitter and ceremony experienced at the Royalty Cinema in Lancaster Road, and certainly not that much fun when you are under ten years old. This entry was posted in Schools, St Quintin Park and tagged coronation, Oxford Gardens, school. Bookmark the permalink. Hello, I went to Oxford Gardens school and remember the Coronation – we lined the route on the North side of what is now St Helen’s Church; I also remember playing on the concrete footings of the original Church – my Mother once told me that it was hit by a landmine during WWII. My family were living in Maxilla Gardens at that time. I also remember going to the Royalty Cinema, as a sort of “treat”. Does anyone know the names of the girls in the photograph? 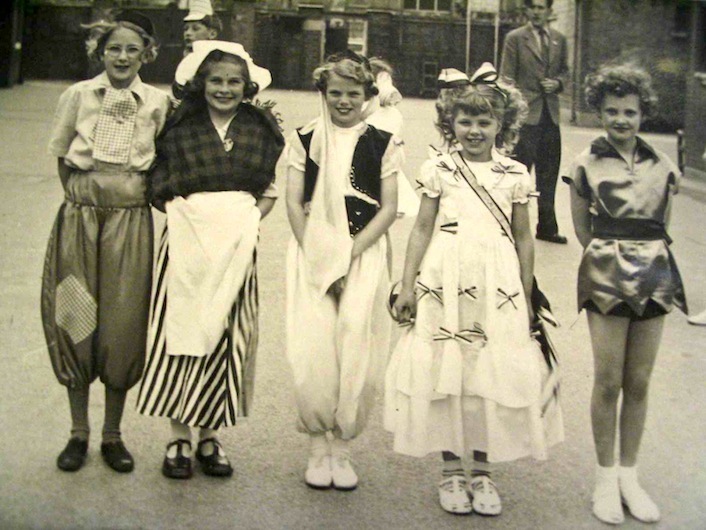 I’m the girl with the big bow in her hair and little bows sewn all over my dress, I can’t remember any of the other girls, My name is Christine nee Harding now Smith and used to live in Highlever Road. My brother Jim went to the same School and was in a sketch – Whats my Line, he played the part of Babs Kelly. It was probably later the same day the photo was taken. We both have lovely memories of living in North Kensington and we were both sad when we moved, leaving our friends behind. I was in the choir at St Helen’s. Mrs Wimbridge was also in the choir and used to take me home to Lancaster Road after choir practice in her big old car. Leather seats, I used to sit in the back. Felt very special. She lived at 111 Highlever Road if I remember rightly. The name of the vicar was Geoffrey Harris. He always used a magnifying glass to read his sermon notes. Miss E Betty Roe MBE was our choir mistress in 1957 and she still lives in Barlby Road (number 10 I think) She is 86 now. So sad to see the dreadful fire in Grenfell Tower. It was not built when I moved in 1959. I have happy memories growing up there. Good to hear from someone of that era. Forgot to say that Mr Wimbridge was a lovely man. Very tiny and frail as I recall. My name was Lillian Young, sisters Betty and Barbara. We used to go to the Saturday morning children’s pictures every week at the Royalty. My mom would give us enough money to have breakfast at the restaurant opposite, then while my sisters stayed in line I would run up to the Portobello Rd sweet stand and buy sweet crumbs for us, that was our treat for a week. Hello all. I also went to Oxford Gardens School from 1954.My sister Rosalind also went there. I remember seeing the Queen go along Ladbroke Grove. My mum worked in Crumptons butcher shop and we sat on the windowsill on the second floor to watch the Queen go past. Brian, do you remember a boy called Johnny Hart who lived in 21 or 23 Maxilla Gardens? Also I had a friend called Johnny Housego who lived in the house at the junction of St Marks Road and Maxilla Gardens. I lived in Lancaster Road at the junction with St Marks Road. You mentioned the fish and chip shop in Ladbroke Grove Brian. My mum worked there. Seems like yesterday and it was a great place to grow up. So good to hear other peoples recollections. Nice to receive a direct response from someone; at last! Yes, I knew Johnny Hart, and Johnny Housego. Johnny Hart lived near the bend in Maxilla Gardens, on the left. Johnny Housego lived in a house in St Marks Road, near the corner, at the junction of Maxilla Gardens and St Marks Road. He used to ride pillion on my motorbike, and he eventually got one himself. I visited Maxilla last July, and it is incredible how much it has all changed due to the elevated section of the A40. It is interesting to learn that your mother worked in those places. I remember the Queen passing us whilst we were standing outside St Helens Church (I believe it was outside the remains of the bombed out church, or the one then being built; which now stands there – I used to play on the bombed out ruins of that church, after WW2; it was hit by a landmine during WW2; my mother told me that the whole house shook when the bomb landed – we lived in the basement flat). I lived at 11A Maxilla Gardens, W 10, with my Mother, Father, brother Clive, and sister, Shirley. Did you know Reggie Harwood (sadly, now deceased). Reggie lived on the left hand side of Lancaster Road, about one third of the way up towards Ladbroke Grove. I am in contact with Reggie’s sister, Donna. Donna moved to Toronto, Canada, and we are both on Facebook. Maxilla Gardens certainly was a great place to live; since it was a U shaped road, with limited traffic. watched in his house. Nat Lofthouse (Bolton) knocked out Harry Greig, goalkeeper for Man Utd. Bolton won 2-0. It was only a few months after the Munich air disaster which decimated Man Utd. I was in Dr Laurie’s on Lancaster Road when the news of the crash came through. short cut to school so it may well be we passed each other in the street. Small world. Do take care. Be nice to hear from you again. Thanks for all that info. Since you went to John Housegoâs house (at the top end of Maxilla, but in St marks Road) I went there a few times, and you may have been there at the time! In about 1960, John was sometimes on my motorbike as a pillion passenger! Eventually, he got a Norton motorbike himself. I moved to Southend on Sea in about 1962, so lost contact; except with those whom I met when I travelled from there to London, mainly at weekends. Where did you live when you attended Oxford Gardens School? coronation on his television. He moved to Gillingham in Kent on his retirement. and get paraffin for our oil fire there. Also Hawkins the grocers shop where you needed the ration book for cheese etc..
Forgot to say there were about 25 other people too in Mr Parry’s front room!!! Needed a shoehorn to get us all in. HaHa. Take care Brian. Good to hear from you.